merchant sailors. The English added the word “apple” to associate it with the commonly-enjoyed apple. Because of its scarcity and desirability in Europe, pineapple was a principal offering to house guests by hosts who could obtain the fruit, which is how the pineapple became a symbol of hospitality. 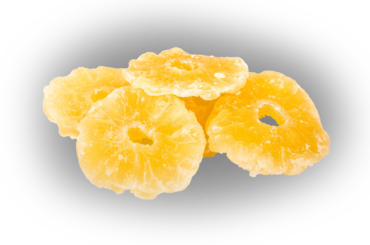 Red River’s dried pineapple is used in trail mixes as well as a sweet and tangy stand-alone snack.